Cultural Heritage in REGional NETworks REGNET. 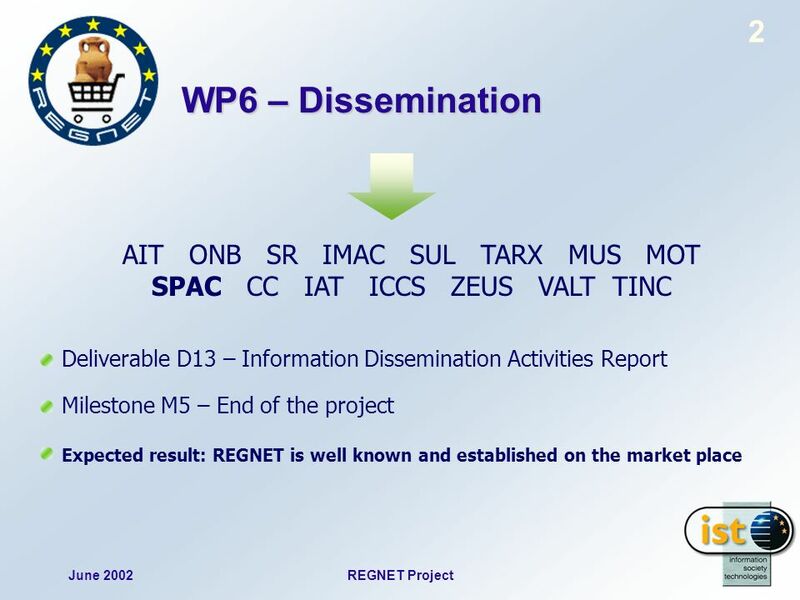 June 2002REGNET Project 2 WP6 – Dissemination AIT ONB SR IMAC SUL TARX MUS MOT SPAC CC IAT ICCS ZEUS VALT. 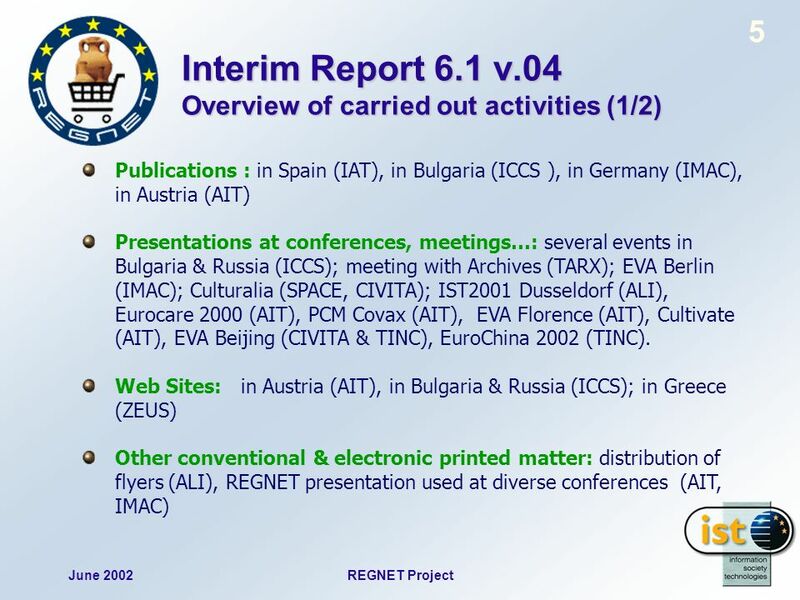 6 June 2002REGNET Project 6 Interim Report 6.1 v.04 Overview of carried out activities (2/2) Other conventional & electronic printed matter: distribution of flyers (ALI), REGNET presentation used at diverse conferences (AIT, IMAC) Contacts : with cultural entities (TARX, IAT), with several EC projects (ALI), EUREKA – EUROCARE-project EACH and KULTURERBE (AIT), with the local Syrian government (AIT). 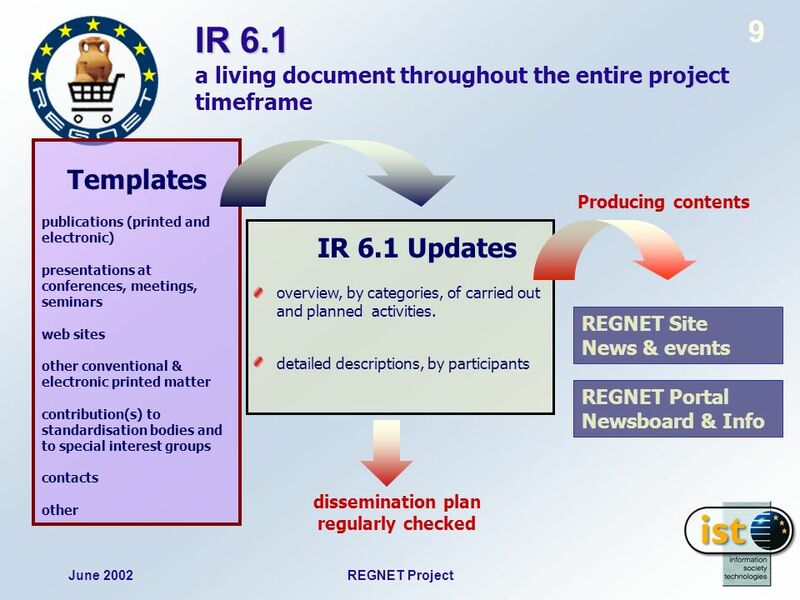 8 June 2002REGNET Project 8 WP 6 – Dissemination channels Publications : at the international level (Cultivate Interactive), at the national level (Bulgaria, Germany, Austria, Spain, Italy) and also at the local level (newspapers and magazines) Presentations at conferences, meetings…: national and international events. Several papers have already been presented (ICHIM01, Europrix-IST, EVA 2001 Berlin, Culturalia, Eurochina 2002 etc.) Web sites : the project web site ; pages and links on the partners web sites Other conventional & electronic printed matter : poster, flyer, leaflets, brochures, CD-ROMs Contacts : with public bodies (national, regional), with institutions in the area of cultural heritage, with similar projects. Download ppt "Cultural Heritage in REGional NETworks REGNET. June 2002REGNET Project 2 WP6 – Dissemination AIT ONB SR IMAC SUL TARX MUS MOT SPAC CC IAT ICCS ZEUS VALT." Cultural Heritage in REGional NETworks REGNET Market Preparation – D6. Cultural Heritage in REGional NETworks REGNET January 2002PMG03 Barcelona – Management Issues 2 Management Issues 0ctober 2001 – January 2002. Carlo DonzellaStatus Task 2.51 Status of Task 2.5 Carlo Donzella - TINC Barcelona, 28/01/02. Cultural Heritage in REGional NETworks REGNET January 2002PMG03 Barcelona - WP7 Status 2 WP 7 - Management Task 7.1 – Project Management Project. Cultural Heritage in REGional NETworks REGNET Implementation of the version 2 of the REGNET-Demonstrator – D8 Implementation of the version 2 of the REGNET-Demonstrator. Cultural Heritage in REGional NETworks REGNET Information Dissemination. 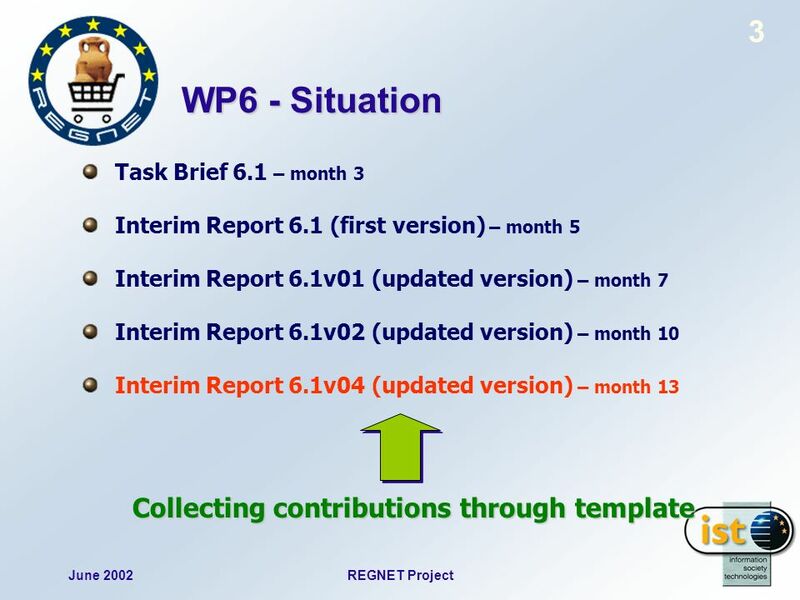 Status Report for WP 1.1 and WP 1.2 Milestones, Results & Actual Work Josef Herget/Silke Grossmann (IMAC), Vic Haesaerts(TARX) Project Management Group. Cultural Heritage in REGional NETworks REGNET Workplan Adherence. Cultural Heritage in REGional NETworks REGNET Review Meeting (REV-01-01), , Brussels. Cultural Heritage in REGional NETworks REGNET. October 2001Project presentation REGNET 2 T1.3. IDENTIFICATION OF STANDARDS TO BE USED 1. OBJECTIVES 2. Cultural Heritage in REGional NETworks REGNET. 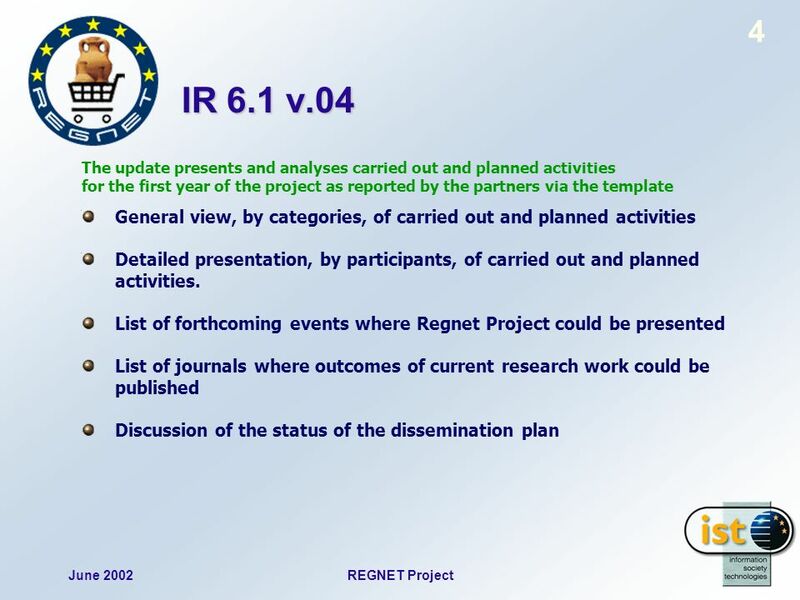 October 2001Project presentation REGNET 2 WP7 - Project Management Software Development Plan Increment. 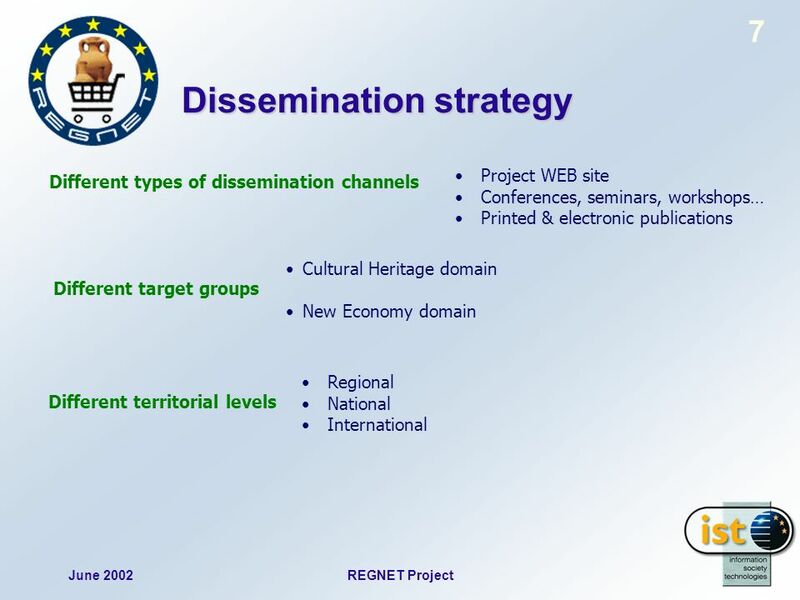 Florence Meeting, September 2001 Regnet CULTURAL HERITAGE IN REGIONAL NETWORKS Interim Report 6.1 – Information Dissemination D 13 – Information. Cultural Heritage in REGional NETworks REGNET. 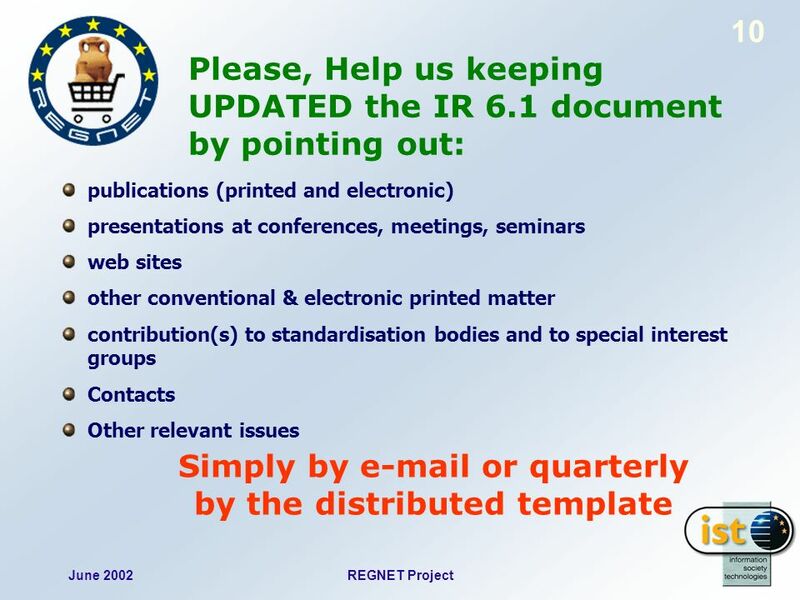 October 2001Project presentation REGNET 2 WP6 – Dissemination AIT ONB SR IMAC SUL TARX MUS MOT SPAC CC. Cultural Heritage in REGional NETworks REGNET T3.2: Preparation of the demonstration. 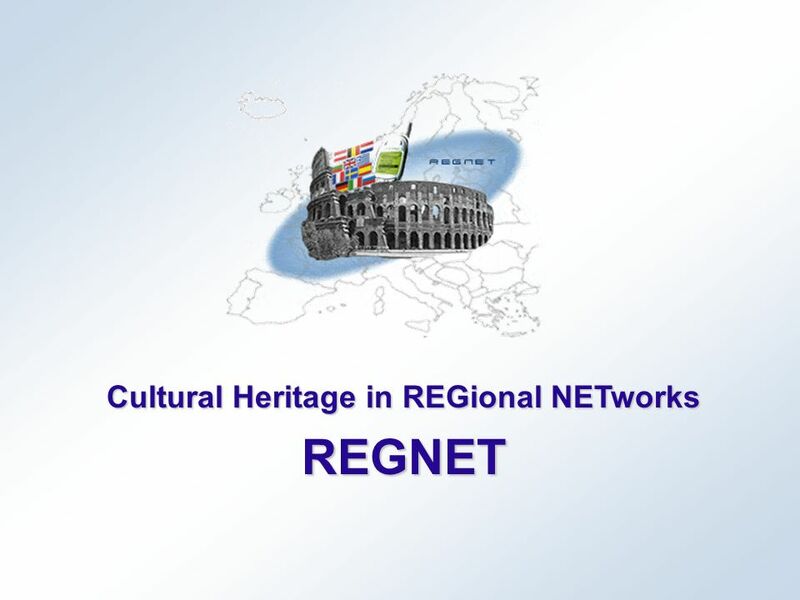 Cultural Heritage in REGional NETworks REGNET. 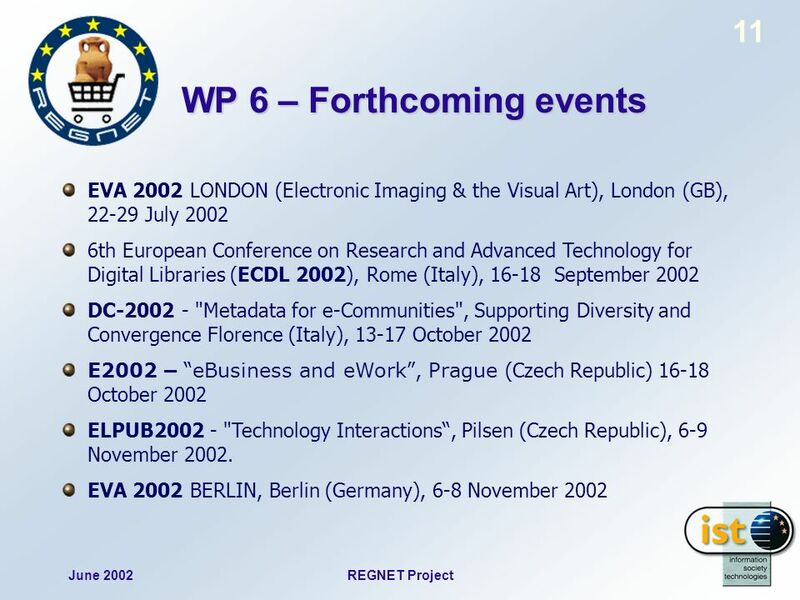 October 2001Project presentation REGNET 2 WP 5 - Overview Development of a Technological Implementation.